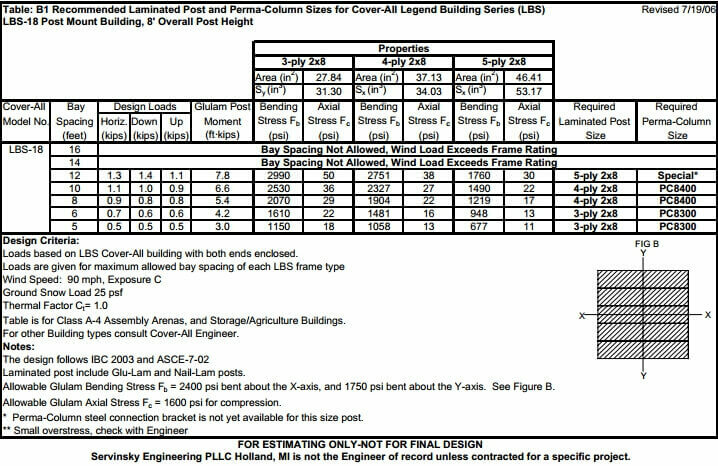 Perma-Columns are typically used as a foundation option for conventional post-frame buildings, but can also be considered for tensioned fabric buildings.Cover-All’s Legend Building Series (LBS) frames are often elevated on post foundations, similar to those used in post-frame construction. 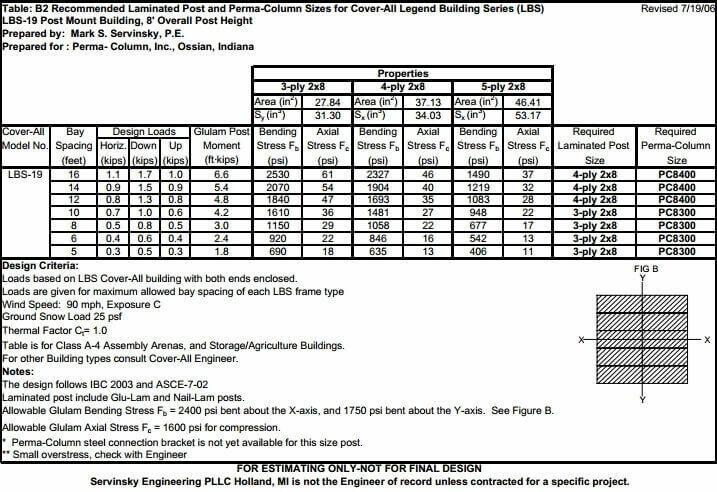 The follow document is a guide to the design process for the use of Perma-Columns with LBS post mount buildings. 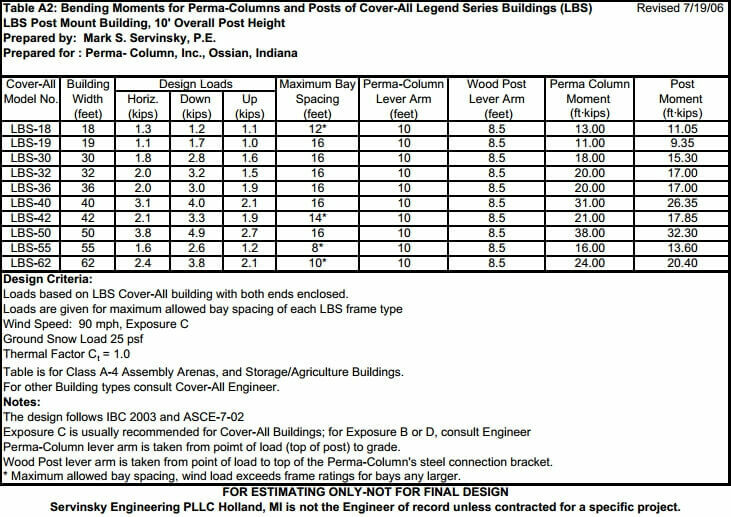 Perma-Column and wood post design methods presented herein are based on sample load cases provided by Cover-All, Inc. Specific building loads vary depending on Cover-All frame type, location, local building codes, and overall dimensions of the building. 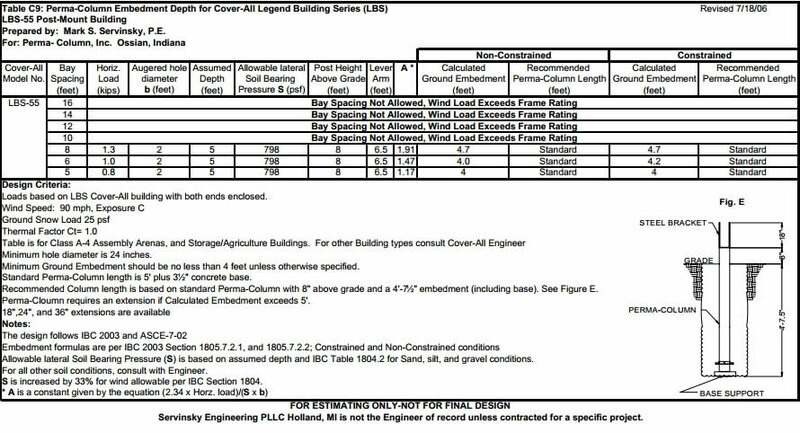 The load cases given in this document are based on site conditions for Oakland County, Michigan. 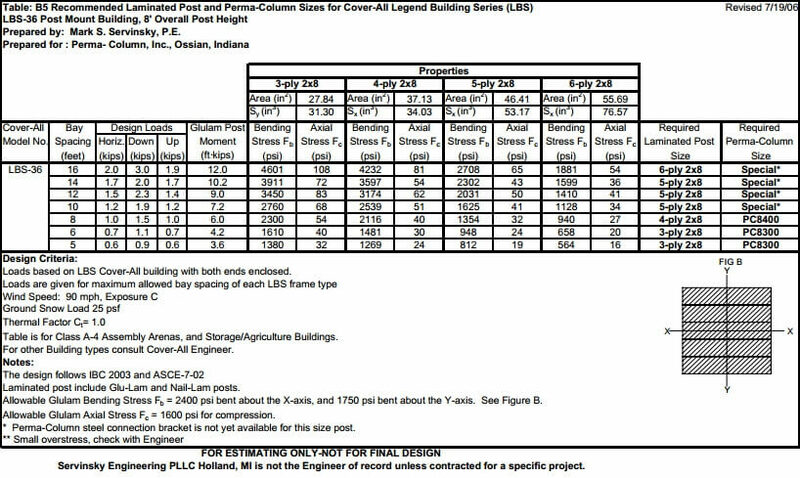 This manual is a guide for preliminary design of Cover-All LBS post mount buildings on Perma-Column foundations located in the United States. Consult a Structural Engineer with experience in tensioned fabric buildings for final foundation design. LBS buildings are conventional tensioned fabric structures with arched frames that provide high interior clearances. The arch design also gives the building structural stability and good resistance to exterior forces, such as wind a nd snow loads. They can be placed on several different kinds of foundations including: concrete walls and footings, piers, and wood or steel posts. 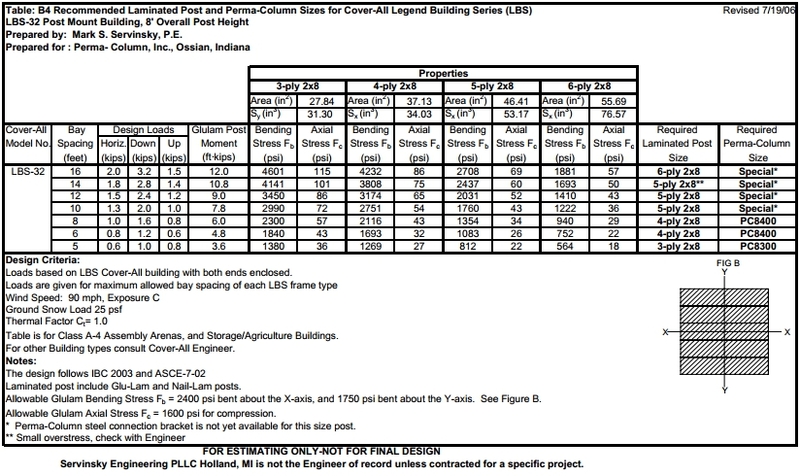 The frame widths available for the post mount application are 18, 19, 30, 32, 36, 40, 42, 50, 55, and 62 foot spans. The distance between fram es (bay spacing) generally ranges from 6 to 16 feet in two (2) foot increments. Although 70 and 72 foot spans are av ailable, they are not intended for post mount applications. Historically post frame buildings have been supported by rough sawn posts. 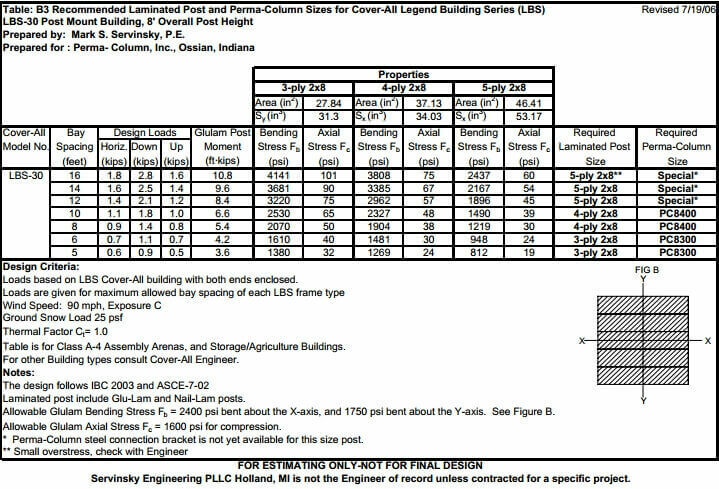 However, because tensioned fabric buildings need suppor t in both vertical and horizontal directions, Servinsky Engineering LLC recommends a stronger post. 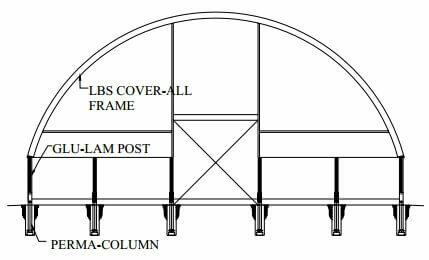 This requirement is because the semi-circular or arched profile of a LBS frame does not have a horizontal chord common to that of a standard roof truss. Without this horizontal chord the post acts as a cantilever beam with a bending moment that occurs near the base. Bending moment is measured by multiplying the horizontal load by the le ngth of the post acting as a lever arm as per Figure 2. The lever arm for the fabric building is roughly tw ice that of the post frame desi gn. Since solid timber posts only have an allowable bending stress less than 1000 psi, the proper solu tion for providing the necessary support is eith er glue or nail laminated wooden posts. The glu-lam posts are rated with high allowable bending stress (typically in the rage of 1900 psi to 2400 psi). Nail-lams are also acceptable but are susceptible to corrosion of the nails and prying of the top plys. 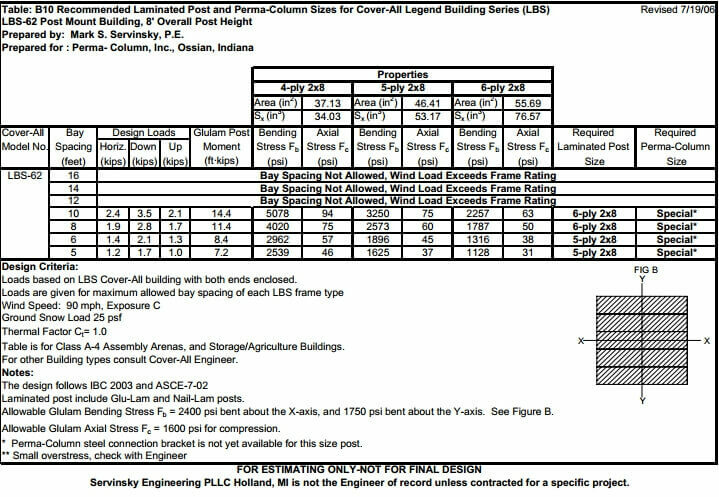 Because the Perma-Column is able to with stand higher bending stress than most glu-lam posts, the building design is controlled by the required post size. However, it is important to consider the stability of the embedded part of the Perma-Column. Soil conditions and depth of embedment will determine the ove rall stability of the Perma-Column. The bending stress of a fabric building’s post also transfers into an overt urning force in the foundation. For this reason it most likely be required that the Perma-Column be in cased in hard pack ed soil or for larger loads, concrete. Embedding the Column in the site’s existing soil usually will not provide enough resistance to the buildings overturning force. The example stability designs giving in Table A include the use of 24” diameter auger cast holes used to encase the Perma-Column in concrete. 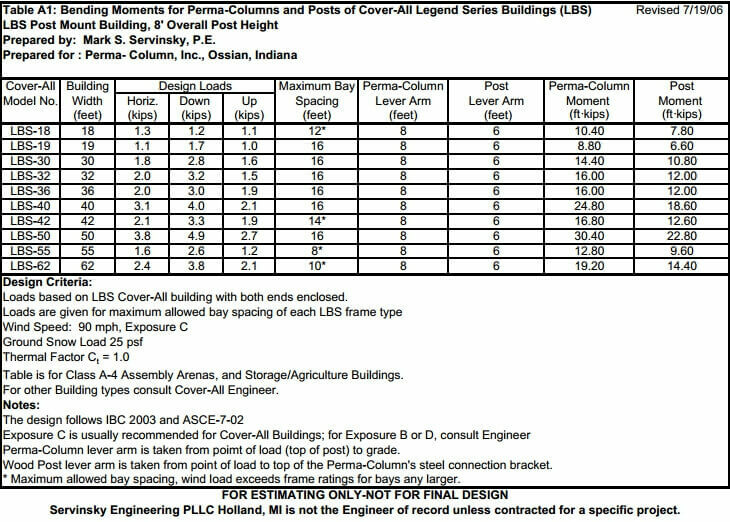 Extensions are available from Perma-Column Co. if the standard length does not meet depth requirements. The extensions come in 18”, 24”, and 36” sizes. There are four (4) steps for designing a post mount Cover-All LBS building using Perma-Column. The foundation loads are given by the building manufacturer as frame an chor loads. 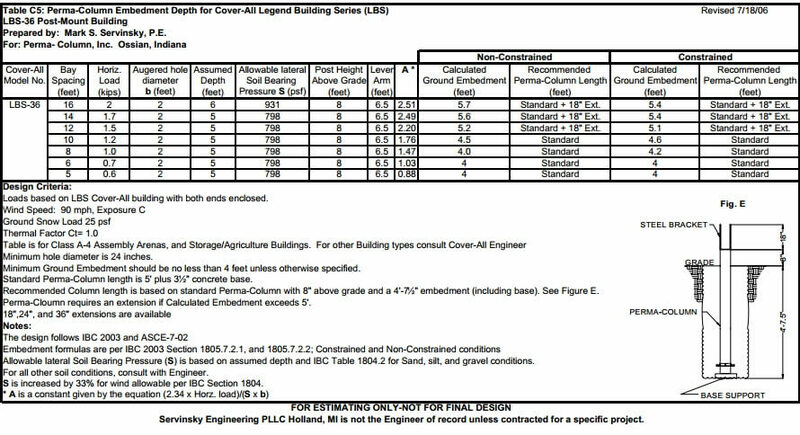 These loads are typically found by using a load ca lculator program supplied by the ma nufacturer. 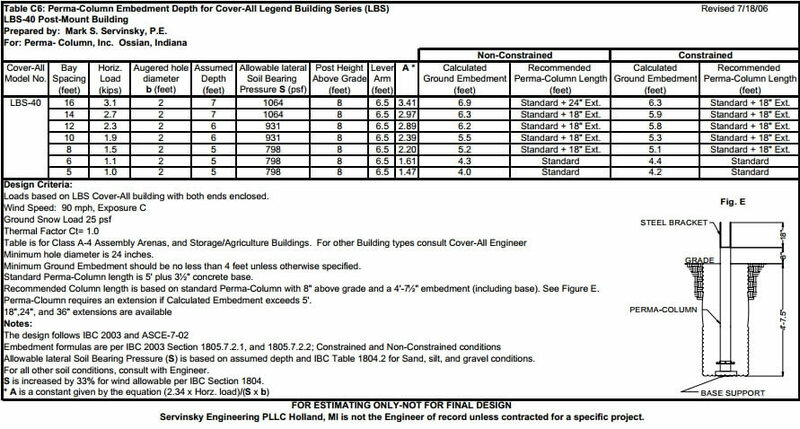 The following factors are used by Cover-All’s calcula tor to determine the foundatio n “anchor point” loads. 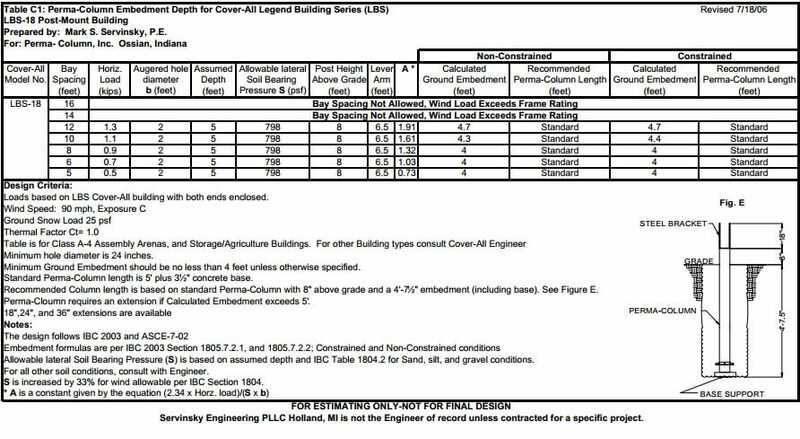 • Wind, snow and live loads are automatically calculated using local building codes, depending on state and county conditions. 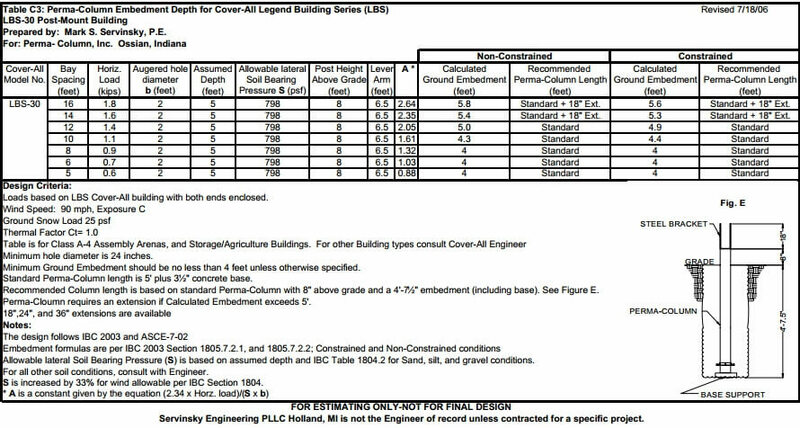 • Bay spacing: 5 feet to 16 feet for all LBS buildings. • Number of ends that have fabric covering. 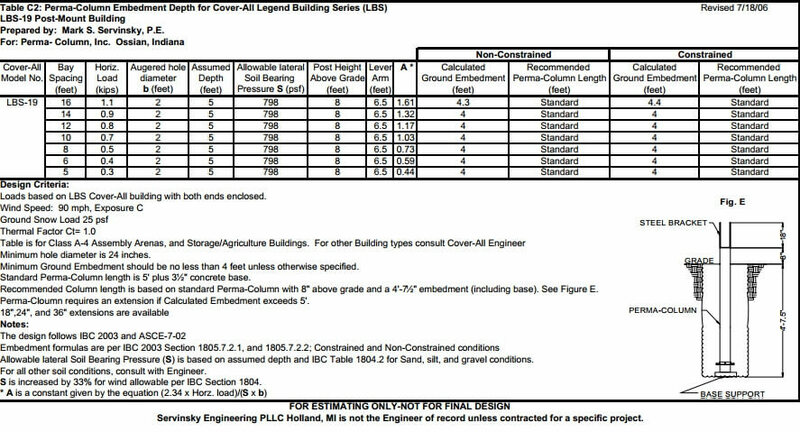 • A Thermal Factor (ct) is chosen depending on if th e building in heated of not. The controlling factor in wooden post design is usually its capacity to resist be nding moments. As mentioned before the bending moment equals the horizontal force multiplied by the lever arm of the post. 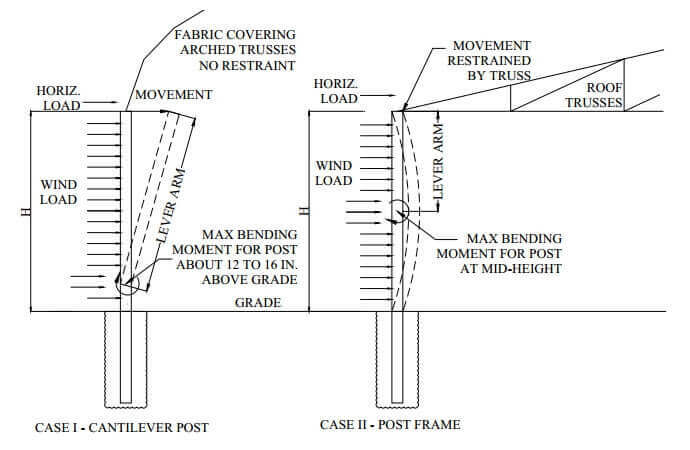 The length of the lever arm is taken as the dist ance from the top of the post to the point of the post that is most likely to rotate when under stress. Since the post is connected to the top of the Perma-Column, the lever arm is assumed from top of the post to the steel U-bracket. The design in this report uses a lever arm of 6 feet for an 8-foot high post. The horizontal force is reported on Cover-All’s load calculator for a given frame size and bay spacing. Once the anchor point loads are calculated, the post can be design to meet the stress requirements. 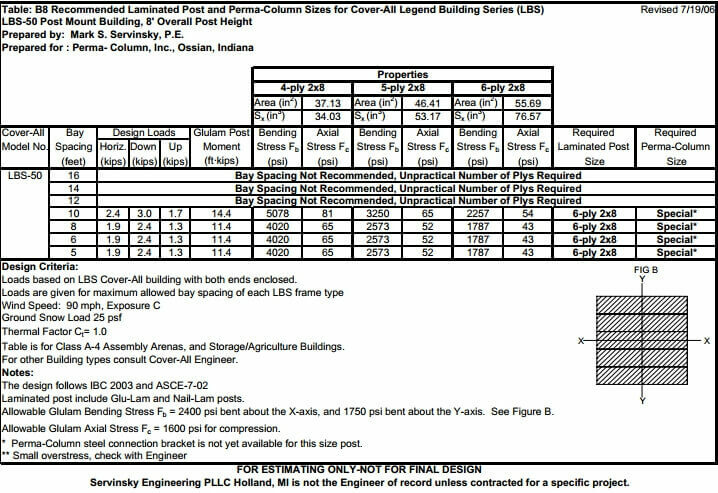 The size of the Perma-Column for a given project is controlled by three things . First, the size of the column should match that of the post. This ensu res the column will be able to withstand the building loads, and a proper connection will be made to the wooden post. Secondly, a stability analysis should be carried out to determine if the column will rotate in the soil. 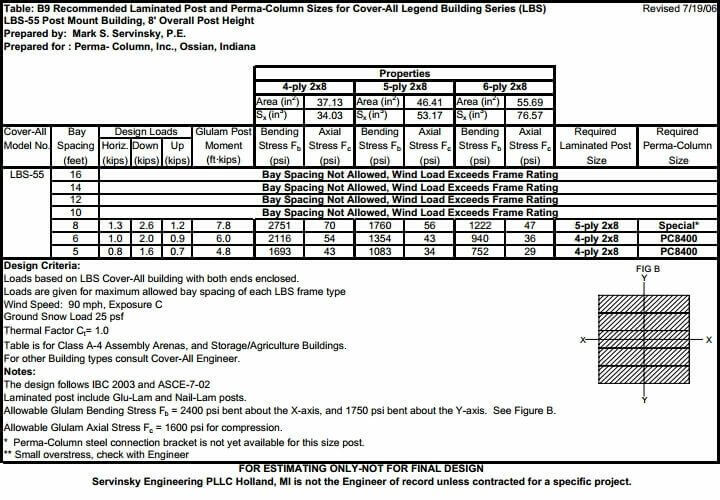 The depth of embedment and soil properties of the location will determine if the column will remain stable under load. 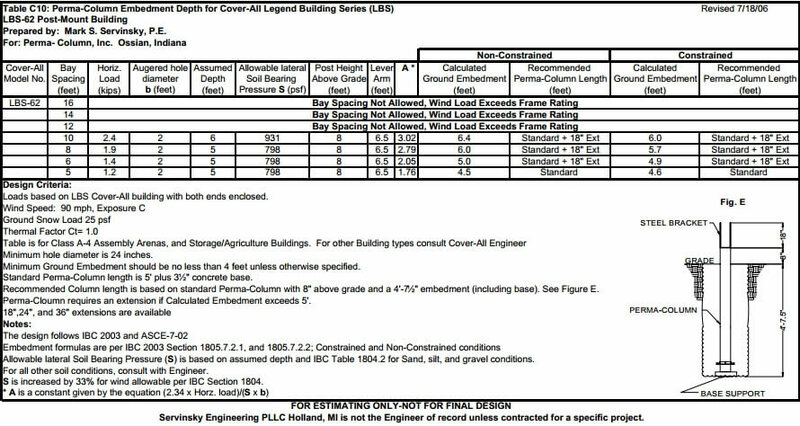 Finally, an uplift calculation will determine if the co lumn will pull out of the soil under wind load. A section of angled steel is attached near the base of the column to he lp resist the uplift. As mentioned above most LBS buildings usually require the Perma-Column to be placed in compacted soil or in concrete to satisfy stability requirements.